A 17-year-old photographer has been announced as the overall winner of the international photographic competition, My Perspective. My Perspective is a photography competition for people with Down’s syndrome, run by the Down’s Syndrome Association (DSA), and the 5th running of the awards attracted more than 300 entries from across the globe. Stephen Thomas' photo, entitled Moraine Lake (pictured above with Stephen), beat off competition from Greece, Indonesia, USA and New Zealand to claim the overall prize in front of a crowd of 200 people at the awards ceremony in Kew Gardens last week [5 June]. When asked why he likes taking photographs, Stephen said: "I like taking close-up and seeing all the details in things. I like taking landscapes. I would like to do more photography especially landscapes and flower close-ups. I would like to take photos as my job." Stephen received his prize from DSA Patron Georgie Hill and last year’s winner Daniel Tomes after attending with his dad David, mum Julie and older brother Paul. As winner, Stephen received a Canon ES1100D camera and bag, along with a canvas print of the winning image and certificate. Having used a Canon 1000D to capture his winning photograph, Stephen said he was very happy with the new model. Shifting Perspectives curator and head judge Richard Bailey also announced a pair of joint second prize winners in Tim Beale (for Chilling Out) and Rosika Edmund (for Flower Poem 2). Both attend the Cricket Green School in Mitcham which had 8 pupils enter, 3 of which were shortlisted. They each received a new camera, canvas print of their image and certificate. 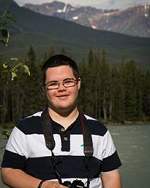 To see the winning images and a full list of shortlisted runners-up, as well as information on how to enter the My Perspectives Photographic Competition 2015 please visit www.downs-syndrome.org.uk.